Born in 1910, Dorothy Herbert was a circus performer who started her career with Duffield’s performance horse troop in Arizona. With them she performed a ‘January Act’ in a clown suit – she was required to fall down and then the horse sat on top of her. Apparently she hated this, but from this humble beginning Dorothy’s career as a circus performer began to take hold. It was when she joined Ringling Bros. and later Barnum & Bailey Circus in 1930, that she became a real star. Trick riding was originally forbidden for women, since it was considered ‘unladylike’ behaviour. However as Dorothy’s career progressed, she expanded her act to include a number of daring stunts. In 1931 she jumped with her then horse, Satan, without holding the reins over a 5-foot (approximately 1.50m) hurdle of fire. In 1933 she learned to ride Roman style with a foot on the back of each horse. 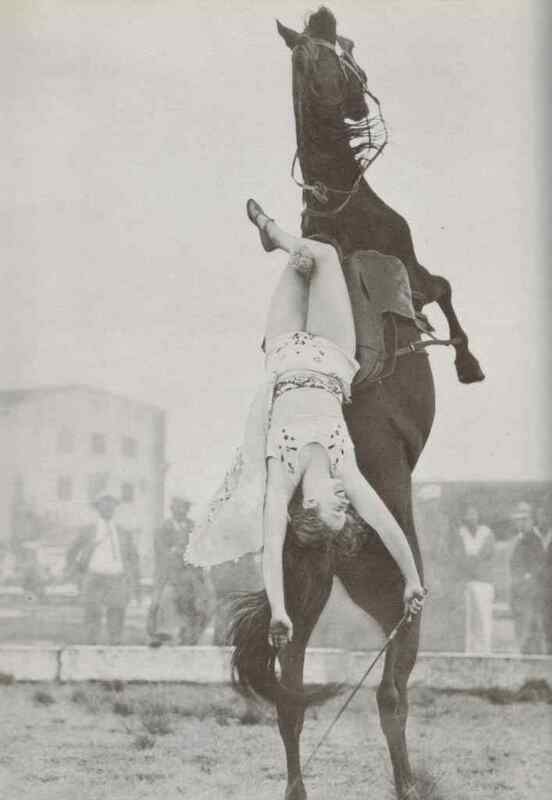 By 1939 however, she had expanded her repertoire to include what became known as her signature move – performing laybacks on rearing horses. Dorothy was a circus star, featuring on 8 circus posters (the most ever issued on one performer) as well as in ads for Camel cigarettes and Wheaties cereal throughout the course of her career. In 1939 she was voted the publics’ favourite outdoor performer. She was so popular that Ringling Bros. sent her to acting school and she scored a supporting role in the movie The Mysterious Dr. Satan and the television series Dr. Satan (in which she performed tricks with her horse). In 1941 Dorothy created the first circus newspaper which was a success with the circus, circus fans and Billboard. Dorothy retired in 1972 but was inducted into the International Circus Hall of Fame in 1978. You can’t help but love Dorothy – she looked like someone who lived life on her own terms. Probably don’t try Dorothy’s tricks at home globetrotters, but have you tried trick riding at all? We would love to hear your stories so please let us know below!